It’s a full contact combat sport that blends techniques from Brazilian Jiu-Jitsu, Boxing, Muay Thai, and Wrestling enabling you to both strike and grapple with your opponent whilst standing and on the ground. Our MMA sessions are therefore demanding, hard work and involve a lot of up-close fighting techniques. If you’re completely new to MMA then our mixed classes are ideal for you. Whilst more experienced students will be in the session you will cover the fundamentals of the discipline before moving on to execute more complex techniques and combinations as you grow in experience and ability. You’ll see from our timetable that Monday’s lesson focuses on striking, on Tuesdays and Wednesdays we look at grappling, Thursday’s session focuses on wrestling techniques and on Saturdays we’re back to striking. This being MMA though you may still be striking whilst on the ground and/or aiming to take someone down when you’re standing up. If you’ve never trained in MMA, Brazilian Jiu Jitsu, Boxing, Muay Thai or Wrestling before and aren’t sure if MMA is for you then you are very welcome to come along to watch a class first. Or, if you’re not sure what is the best way to start your MMA training, please call/email us for advice. 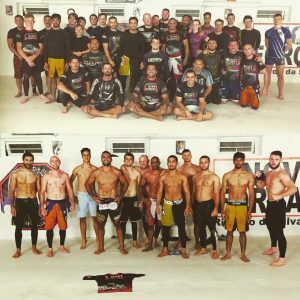 As mentioned above, most of our MMA sessions are mixed but intermediate/advanced students are paired with others of a similar experience, ability and size and techniques and combinations will be complex and appropriate for your level of experience. We also have a class just for you on Thursday evenings which includes as much sparring as you would like. If you’ve never trained at Nova Forca before, Edge (our Coach) will need to see you train in one of our other MMA classes before you join this one though. For your first few classes all you will need are a rash guard or t-shirt and shorts with no zips and/or buttons (and preferably no pockets) on any item of clothing, and please ensure your fingernails and toenails are short! MMA shorts and a rash guard/t-shirt with no zips, buttons and/or pockets on any item of clothing. Please also bring a gum shield, MMA gloves, a groin/chest protector plus hand wraps, boxing gloves, shin guards and a head protector. Potential students are welcome to try out one of our classes for free. Just click on the ‘Sign up for a trial class’ button and complete the form. Ideally, please give us at least 24 hours’ days notice of when you’d like to join a class so we have time to let the instructor know. MMA is often cited as the world’s fastest growing sport and we receive lots of emails from people who are interested in competing on an amateur, semi-pro or professional basis. If you’d like more detail please speak to Ricardo or Edge, our MMA coach, when you’re next at the gym or get in touch via email/phone.